Betty Crocker Cookbook, pie crust, pie pastry, Quiche, Quiche Lorraine, Quiche recipes, Recipes, Standard Pastry, Whatever Happened to Dinner? 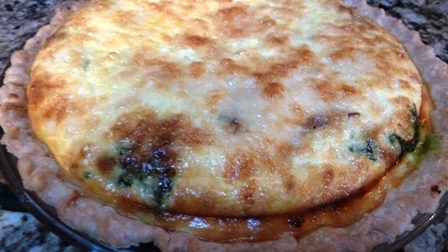 I had not baked quiche in years. Our food/fellowship committee at church asked if I could make one for a luncheon and I was happy to oblige. I wanted a good basic recipe so I went to my faithful Betty Crocker Cookbook. And then of course adapted from there. 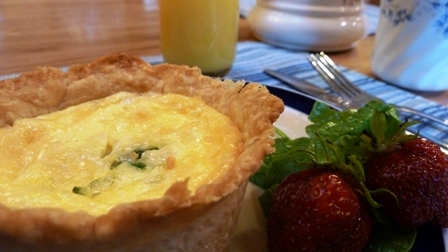 I made sure to use up the pastry remains in a small tart so I could test the quiche before sharing it. It was everything I wanted: light and fluffy, punctuated with pleasant (but not loaded or overpowering) flavors of bacon, spinach and onion. Perfect, in my book. Still, the heavy cream bothered my calorie-counting tendencies. Next time I’ll try just half and half. I doubt there’s much difference in outcome. If pie crusts are easy for you, then this recipe is a no-brainer and only a little more time consuming than making scrambled eggs and bacon for breakfast. If you’d rather have a mammogram than make pie crust from scratch, then pick up a pie crust (boxed dough or shell) in the grocery. 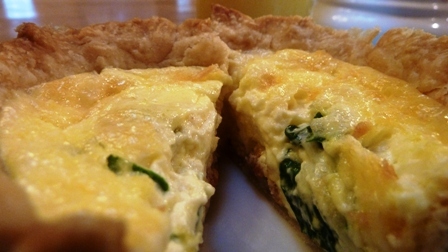 The Lorraine part of the name is for a region of France and usually refers to a quiche with bacon. 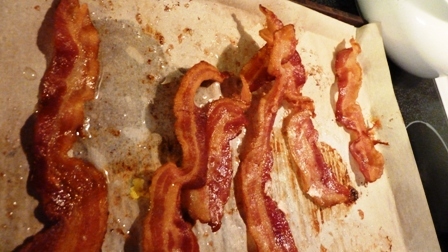 To bake bacon, just use parchment paper and 385 degree or so oven. So easy! No need to turn. Heat oven to 425 degrees. Prepare pastry. Sprinkle fried bacon, shredded cheese and chopped onion evenly in pastry-lined pie pan. Beat eggs slightly; beat in remaining ingredients. Pour cream mixture into pie pan. Bake 15 minutes. Reduce oven temperature to 300 degrees and bake 30 minutes longer or until knife inserted 1 inch from edge comes out clean. Let stand 10 minutes before cutting. Serve in wedges. Makes 6-8 wedges. *I also decided to use Betty Crocker’s basic pie crust recipe. My daughter and I recently discovered the recipe I’d be using and sharing for many years, was quite off in certain quantities that I had always compensated for by adding more water or flour until my consistency was right. The recipe below, straight out of Betty without fudging, was perfect: flaky, rich without being over rich, easy to roll out. Measure flour and salt into bowl. Cut in shortening with pastry blender thoroughly. Sprinkle in water, 1 tablespoon at a time, mixing until all flour is moistened and dough almost cleans side of bowl. Gather dough into ball; shape into flattened round. Lightly flour the round and place on lightly floured board or counter. Lightly flour rolling pin, and roll dough into round 2 inches larger than your pie pan, adding small amounts of flour if needed to keep dough from sticking. Turn over 2 or 3 times as you roll out to keep from sticking to surface. Place rolled out dough in ungreased pie pan. Cut off extra edges of dough. 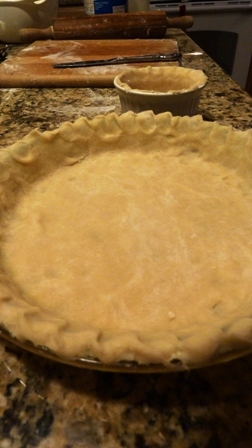 Form top edge of pie crust by your favorite method, pinching or twisting dough. Please let me know your go-to favorite basic cookbook, or a link for a great quiche recipe you like. Here’s one of my favorite blogger’s take, by Jennifer Murch & Simply in Season. If you haven’t seen the NEW expanded edition of Simply in Season yet (2015 edition) with new gorgeous food photography, check it out! I’ve changed up my normal photo style/mode here. Do you like it? Or do you like my standard straight down the middle posting mode? Or no preference or opinion? Quiche is a dish I sometimes order when I’m with lady friends in a restaurant where I’m pretty sure the crust will be flaky. My bacon usually goes into BLTs. You are a culinary artist, Melodie. It seems to be a popular in gal get-togethers for sure! 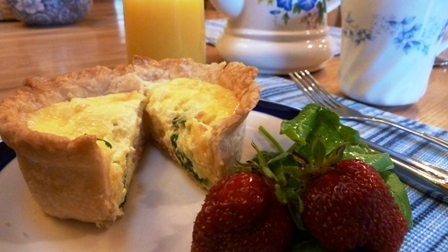 My mother claims to not like spinach either cooked or in salads, but I chuckled to myself when she oohed and ahed over herquiche at a little spot at “The Old Bag Factory” string of small shops and cafes in Goshen that we enjoyed last summer. Yes, there was spinach in her quiche but she did not realize it. I will save the recipe and hopefully one of these days I will be up to giving it a try . Thanks, dear, for your feedback on the photo layout & kind words. I hope too you will be up to giving it a try–not for my sake but because it will mean you are having a good day! The recipe for pie crust in the Betty Crocker cookbook is my go-to recipe. I have tried several others but I come back to this one. I don’t make quiche often, and when I do I don’t make the crust. My hubby is not a pie crust person, and although I love it!! I don’t need the calories. Have you seen an increase in the price of eggs in your area? Someone told me today that eggs were $4.00 a dozen at Walmart (and that’s not organic). Our Sav a Lot has them for $3.49!